2012 the Arctic ice cap shrunk to it’s lowest level ever. See the ice melt in real time above. Between 2003 and 2008, up to 2 trillion tons of ice in Greenland, Antarctica and Alaska have melted. …and this acceleration could spin out of control. For example, if the average global temperature increases more than 3 degrees Celsius the Greenland Ice Sheet could become unstable. This would have devastating effects. This is a rough approximation. 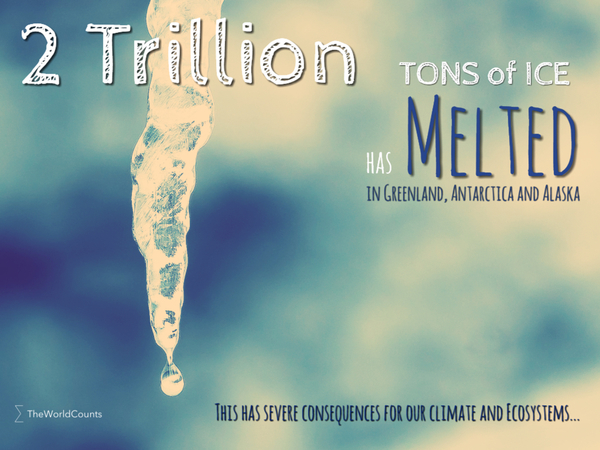 According to NASA, an estimated 2 trillion tons of ice melted from 2003-8 (5 years). That is an average of 400,000,000,000 tons a year. Interested in more facts like the melted ice? Then plug in and subscribe to our newsletter.